[A]: When another ::Nova Grappler:: Rides on this, you may call this to (R). 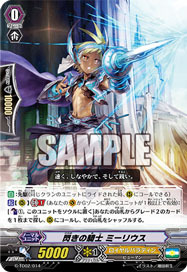 [S] [(R)]: [Counterblast: (1), Put this in Soul] When this Boosts a ::Nova Grappler:: and the attack hits a Vanguard, you may pay cost. If so, choose 1 of your ::Nova Grappler:: Rearguards with "Beast Deity" in the name and Stand it. Most battles involving the Beast Deity Army are decided by the first combatant.